A young boy collects dung-fuel onto a mat from the ground inside the family kraal which is surrounded by thorny shrubs. 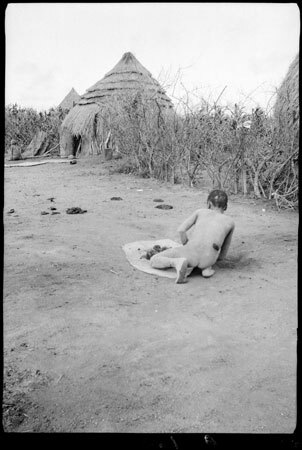 In the far corner is a sleeping hut of the family with its woven door ajar and another young person sitting on the ground just outside. Morton, Chris. "Nuer boy collecting fuel" Southern Sudan Project (in development). 03 Jan. 2006. Pitt Rivers Museum. <http://southernsudan.prm.ox.ac.uk/details/1998.355.65/>.